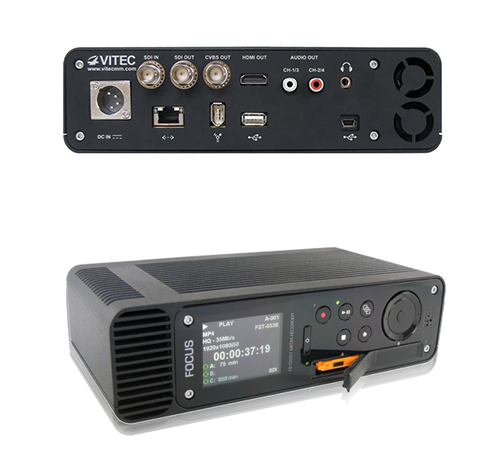 The next generation Focus FS-T2001 professional media recorder and portable field deck is ideal for both Electronic News Gathering (ENG) and Electronic Field Production (EFP). Designed to meet the needs of broadcasters as well as producers, Focus FS-T2001 makes managing video content and distributing it via networks or physical media a snap. Focus FS-T2001 supports Sony 50mbps MPEG HD422 as well as XDCAM HD/EX professional recording formats. The flexible, feature-rich Focus FS-T2001 provides 250GB of internal storage capacity for recording/playback and media management. An intuitive thumbnail clip menu makes it easy to find recorded video clips and play them back on the Focus FS-T2001 LCD screen or an external SDI or HDMI monitor. Integrated SxS slots make it easy to transfer content to removable professional media such as SxS Pro+, SxS Pro, SxS-1 and SDHC adapters. Clips may be quickly copied between cards or from cards to the integrated hard drive. They may also be transferred to a computer via cable or shared over the network using CIFS or FTP via an ultrafast 1Gbps Ethernet connection.